At 11:00 am on Wednesday, 6 April 1966, a class of students and a teacher from Westall High School were just completing sports on the main oval when an object, described as being a grey saucer shaped craft with a slight purple hue and being about twice the size of a family car was spotted. According to the witnesses the object descended and then crossed and flew over the high school’s south-west corner, travelling in a south-easterly direction before disappearing from sight. It descended behind a group of trees and into a paddock at The Grange which was in front of the Westall State School. During the incident a young student, Victor Zakruzny, stood to the left close to the object, three other students stood around in close proximity to the second object. A teacher and at least a dozen other students crowded along the high fence to get a view. The two objects rose up from the grass and took off, one to the west and the other flew up and orbited a small plane before flying off to the south west, with students in pursuit. The UFOs were described as about 1.5 metres in height and approximately 5.4 metres in width. Also described as being a “grey saucer shaped craft with a slight purple hue”. It was twice the size of a family car, very round and large at the base but thinner at the top. Like an upside down saucer from a tea cup. It was also reported that there were two other smaller craft of similar design that hovered over the dirt roadway at the front of the school, they did not land but just hovered above. Additional reports suggest that the larger main craft which had landed in the paddock may have had some sort of problem and that the two smaller craft were there to assist it. One of the students, a girl, ran towards the craft that had landed and reached it before the other students had arrived. She was found in a collapsed and dazed state. An ambulance was called and she was taken to hospital. This student that was taken to hospital never returned to Westall High school. Her family moved out of the family home that night, never to return. NOTE: The above image is CGI.
. Cuban radar then reported the UFO quickly accelerated and climbed above 30,000 meters (98,000 feet). At last report, it was heading south-southeast towards South America. Within hours, Personnel of the Detachment received orders to ship all tapes and pertinent data to NSA and to list the Cuban aircraft loss in squadron files as due to “equipment malfunction.” At least fifteen to twenty people in the Detachment were said to be fully informed of the incident. 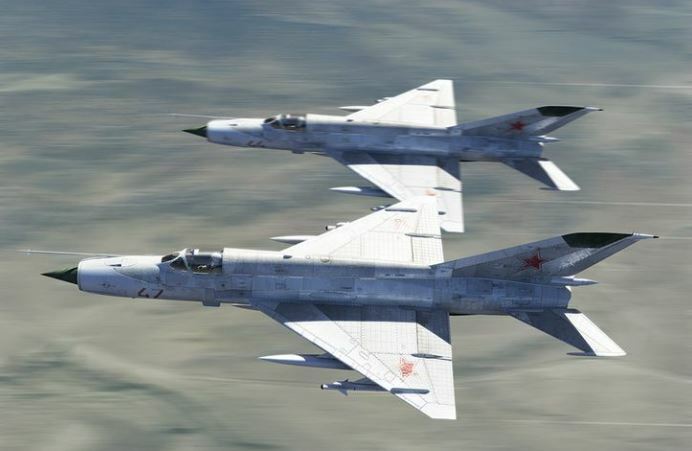 Presumably, the data sent to NSA included direction-finding measurements that NSA might later combine with other site’s data to triangulate the location and altitude of the MIG-21 flight paths. If the AFSS equipment in Florida was sensitive enough, the UFO could have been tracked by its reflection of the Cuban ground and airborne radar. NOTE: The above image is CGI. The sighting occurred Saturday, May 20, 1967, in an area near Falcon Lake, Manitoba, Canada, approximately 75 kilometres north of the American border in the rocky edge of the great Canadian Shield. Stefan Michalak was an amateur geologist and had worked the area many times. In his pursuit in finding silver deposits he traveled from his home in Winnipeg to Falcon Lake to try his luck. Around 12:15 p.m while working, Michalak was startled by the cackling of some geese, who were obviously disturbed by something. He looked up and was surprised to see two cigar-shaped objects with “bumps”. The objects now clearly a disc-shaped objects descent together from the SW at an angle of 15°-20° above the horizon. One stopped 10-12 ft. above the ground; the other continued downward, and landed on the flat top of a rock outcropping 160 ft. from him. The one in the air when departed was changing colours from a bright red to orange to grey and so on as it flew into the west, where it disappeared into the distance. Now focusing his attention to the object on the ground, Michalak saw that it, too, was turning from bright red to orange to grey, until it finally was the colour of iridescence of hot stainless steel, surrounded by a golden-hued glow. The craft had no markings. Intense purple light shone from apertures around the dome of the craft. For the next half-hour he stayed near the rock, making a sketch of the object and noting various features. When the craft had left, Michalak noticed a strong smell of burning electrical circuits mixed with the original smell of sulphur. He walked over to where he had left his belongings, and saw that the needle on his compass was spinning erratically. He went back over to the landing site and immediately felt nauseous and a surge of pain from a headache. He reached the highway and requested help from a constable of the Royal Canadian Mounted Police (RCMP) who was driving by. The constable refused to help. He also failed to get help at the park headquarters and went back to his motel were he stayed the night before. After several hours, he took a bus to Winnipeg. While waiting for the bus, he telephoned the Winnipeg Tribune to request assistance, asking, at the same time, he said, that they give his experience no publicity. Michalak was met by his son, who took him to hospital for medical attention. The burns on his abdomen were diagnosed as superficial, and returned home. He continued to complain of nausea, headache, offensive odour from his lungs, lack of appetite, and rapid weight loss. Two days after the alleged event, Michalak was attended to by a personal physician, whom he had not visited since Spring 1966. The following day he was taken to hospital to be checked for radiation trauma by the hospital’s Department of Nuclear Medicine. A radiation pathologist found no evidence of the effects of radiation on the burned area, in his blood, or on his clothing. He reported that the burn was thermal. A week after his sighting MIchalak was checked in the whole-body radiation counter at an Atomic Power Installation. This counter detects and measures gamma radiation from isotopes in the body. The test showed no count above normal background. MIchalak said he lost a total of 22 lb. over the next seven days, but had regained his strength and some weight 11 days after his sighting. A UFO, about 20 to 30 feet in diameter, was caught on camera hovering for around one to two minutes at approximately 60-70 feet. UFO researcher Yusuke J. Matsumura at Flying Saucer Research group in Japan had snapped a picture of the object before it was able to take off at an estimated Mach 152 in 70- degree elevation. The witness was outside his resident at 1687 Hama Isogo Ku Yokohama at around 13 minutes to 10 in the morning when the incident took place. He said that he was leaving his house to go to Tokyo when he saw a metallic flash just above his house. He managed to get his primoflex automatic – Japanese rollei automat – camera and took a picture. After hovering for a minute or two, the large UFO took off toward southeast in general direction of Tokyo Bay. During the second part of the night of November 1 to the morning of November 2 of 1968 Dr. X, was sleeping in his room when he was awakened by his son’s calls (he was not crying). Seeing his wife was still asleep, the Doctor rose up with some difficulty without turning on the light, and crossed the corridor from one room to the other. At that point, he became aware, although not paying attention to it, that a storm seemed imminent. He found his son standing up in his crib exclaiming and pointing very excitedly towards the window. The window blinds were of the solid kind and closed, but the small openings at the top and sides allowed the doctor to see the intermittent light of what he at first assumed to be flashes of lightning. While he was switching on the room light, it seemed like there was a mighty wind blowing above the house, while the rain whipped against the walls, the tiles, and the blinds. Curious about those flashes of light The Doctor decide to investigate their source. Looking through one of the windows he saw what appeared to be two identical luminous objects, the one on the right seeming to be a little smaller and slightly above and behind the other one. Initially the Doctor was under the impression of being either two cigars or two circular objects seen in profile. Each object consists of two superimposed parts that are markedly symmetrical throughout their horizontal extent, the upper portion appearing perhaps to be thicker. The colour of the upper part appears to be a luminous silvery white, but much less so than the full moon. The colour of the under part is a deep sunset red, brighter at the top than at the bottom. No structure can be distinguished in either the white or the red portion. No variations either. He can distinguish some vertical antennas on them. They seem to be as the same colour and the same luminosity as the upper parts of the objects. The length is apparently equal to the thickness of the object. The bases of these two antennae are thicker than their upper part. The two other horizontal antennae seems to be of the same colour and brightness and apparently of the same length. However this horizontal antennae are more slender and do not appear to be thicker out at the base. They are seen as a silhouette in the red portion of each object and extend beyond it slightly. Their bases are located at the junction point where the red and the white parts meet. They are parallel and pointing slightly towards the left of the witness. At this moment only one horizontal “antenna” is visible on each object, any other possible “antennae” being hidden by the objects. The lower centre part of each object is emitting a vertical cylindrical white shaft of light – brighter throughout its whole extent than the witness could have expected from a simple beam of light – which, as it passes through it, illuminates the thin storm mist hanging in the valley. The source of the two beams of light is not discernible at that point. The two objects display in unison a cyclic luminous activity of a periodicity that is perceived to be about equal to one second. It begins with white flashes that give the witness the impression that they are “entering” through their external antennae, then another flash shoots out between the two objects, linking the tip of their horizontal antennas. The Doctor felt a strong impression that the flash shooting out between the two objects is a consequence of the external flashes, He says: “It seemed to me that the two objects were sucking in the atmospheric electricity and that I could see it entering through the antennae and then exploding between the two objects, the whole thing producing one single glow of light.” The flashes are white, not dazzling, and are silent. The form they take is a slight prolongation of the antennae in a straight line, without any spreading, and with a slight trembling movement. Their intensity is the same as the intensity of the vertical beams of light. At the beginning of the sighting, the two objects were moving as one unit towards the left, at the same time approaching slightly nearer to the Doctor. The two objects continue their movement in the same direction and at the same apparent speed. Then the two objects perform a rotation on their axes, the witness now discovers that the external horizontal antennae are performing the same luminous “absorption”activity as the inner antennae, They seem to lie on one single straight line which appears to be parallel to the trajectory of the two objects seen by the witness. Now located side by side, the Doctor described the objects of identical size, and presenting their horizontal antennae symmetrically. At the same time, the sources of the light beams become visible on the lower surfaces of the objects: it is a sort of protuberance of the same red colour as the lower surface, but of a darker shade. The two objects commence a new manoeuvre that consists in drawing near to each other increasing their the luminous activity. At this moment the witness observes that the lower spotlights of the beams are approaching each other, then they interpenetrate each other and become only one spotlight. For a brief instant afterwards, the inner antennae touch, and at once all the luminous activity ceases on all the antennae, which however remain luminous. Darkness falls once more over the countryside. Meanwhile the two objects continue to draw closer to each other. The inner antennae interpenetrate each other and then disappear entirely when the two objects come into contact. There is now only one object, absolutely identical with the two antecedent objects except for one detail … at the precise moment of their complete unification, Dr. X sees for the first time “something that is moving” in the red (lower) portion of the object. At the same time, the leftward movement stops, and the object begins to come straight towards the witness, growing rapidly in size, while the light-beam cuts a straight path across the plain towards the house, and the moving structures of the red portion appear more and more clearly visible. The object grows in size until it is enormous. Around the light-beam, its light and the light from the object dimly light up the houses and the trees. When it halts, the lateral antennae are seen as precise prolongations of the juncture points of the two portions, upper and lower, ”like a chicken on a spit”. The white upper part presents nothing singular as regards either colour or brightness. The upper antenna is merely an extension upwards. The device from which the cylindrical light-beam shone out had the appearance of a ringed corona, on which Dr. X is able to count, bounded by black lines, six sections on the side that is visible. These sections appear with the distortion due to perspective, wide in the centre and narrowing towards the edges. But it is the domed red (lower) part that presented the most impressive features. This part was also divided into ”sections” but, it seems, in violation of the laws of perspective. Of the eleven visible sections five (the paired sections) were traversed from top to bottom in about four seconds by a dark horizontal line “like the lines that move across a TV screen when you are adjusting it”. The moving line descending cyclically appeared like an intense deepening of the colour, with shading off on each side. The witness was unable to detect any coordination between the respective movements of the five lines. It merely seemed to him that when one line was disappearing towards the bottom, another one was appearing above. All the red portion of the object gave the impression of incandescent metal or of internal lighting. Although all this animation of the red portion seems to have occurred in violation of the laws of perspective, the vertical bands were wider towards the centre, right opposite the witness. The activity in the red portion lasts for a period that the witness is unable to estimate subjectively, for he is obsessed with the movements of the horizontal lines. Meanwhile, after a period of time which seems long to him and during which the object remains totally immobile, he sees the spotlight move towards him, slowly at first, over a distance of a few metres, lighting up one by one the telephone poles and reaching the top pole. This movement of the spotlight was the result, not of the objects having come nearer, but of a rotation around the axis formed by the two horizontal antennae, which rotation tipped the upper part of the object towards the valley and revealed progressively more and more of the lower surface. Suddenly the rotation speeded up in an astonishing fashion and the doctor was hit by the light beam, which shone all over him as well as probably over the whole front of the house. The total duration of the rotation was brief – of the order of a second. Meanwhile, Dr. X had sufficient time to observe the lower surface of the object, which appeared to be circular and divided into radial sections. He does not remember whether the movement of the lines was still visible in the sections. He had the impression that the corona from which the beam of light emerged was growing wider towards the periphery as the object tipped. During the tipping, the witness was frightened, and at the moment when the light-beam reached him he instinctively covered his face by a reflex action. At the moment when the object was presenting its lower surface vertically, there was heard the first sound since the beginning of the sighting, namely a sort of “bang” while, according to Dr. X , “the object dematerialized”, leaving behind nothing but a cloudy, whitish, fleecy shape which at once disintegrated and was borne away eastwards by the wind. At the same time there came, from the centre of the space occupied up till then by the object, a sort of very luminous, fine, white, straight thread, which shot out vertically in a fraction of a second towards the sky and vanished there, forming, apparently at a height of several hundred metres, a small white shining dot which itself then vanished with the noise of a firework. The darkness having returned to the valley, the witness experienced a nervous breakdown. Deeply shaken, he immediately went back in the house and went to the previously-mentioned clock to see the time: it is 4.05 a.m. Ten minutes have elapsed since his first visit to the kitchen. He gets a notepad and writes down the details of his sighting along with sketches. Then he awakens his wife and tells her what he has seen. Both are very deeply moved. Suddenly Mrs. X cries: “Your leg!” And, in fact, Dr. X, who is walking to and fro, talking excitedly, no longer limps, and has completely forgotten his leg injury that was produced recently while chopping wood. Dumbfounded, he turns up the pyjama trouser-leg: the wound is healed and the swelling has disappeared along with the pain – never to return. Dr. X and his wife discuss the incident for half an hour and then go back to bed. Ten minutes after he has fallen asleep again, Dr. X starts talking in his sleep – something that has never happened to him in his life before. Disturbed, his wife listens for a while and then finding that what he is saying relates to the phenomenon seen by him, she turns on the light and takes notes. She puts down this statement: “Contact will be re-established by falling down the stairs on November 2nd.” At about 7:00 a.m. the doctor stops talking. Mrs. X turns out the light and goes to sleep. She awakens again at about 10.00 a.m. and, seeing that her husband is still sleeping, she gets up without waking him. He sleeps on until 2 o’clock in the afternoon. In the days that follow, the doctor is under the impression that the wounds inflicted during his service in the Algerian War (which had remained unchanged for ten years) have completely healed. The nervous breakdown and the distress that had followed the events of November 2 are however so painful that he feels ill and cannot be sure of their disappearance. He has lost weight and his features show great wear. That same day, cramps and pains appear in the umbilical region. They persist, more or less acute, throughout the following week. On the evening of November 17, he begins to feel an itching and tingling around his navel, and a red cutaneous pigmentation of striated appearance develops. By midday on November 18, this pigmentation has assumed its final form, namely the shape of a perfectly geometrical isosceles triangle with a well-defined perimeter, measuring 17 cm. on the base and 14-15 cm. along the sides. At the same time the pains, itching and tingling cease suddenly and entirely. More and more worried about this preposterous phenomenon, the doctor and his wife telephone French ufo investigator Aimé Michel. This triangle certainly has no known precedent in the annals of Ufology, but he is reminded of the cases of irradiation reported on several occasions, and advises him to have a thorough medical examination. This is done, that same day. The medical examination is negative: the dermatologist can find no explanation for the phenomenon, which he considers so astonishing that he wants to make a report about it to the Academy of Medicine. Dr. X is little inclined to such publicity. Curiously, the next day, he calls Aimé Michel again, and says: “I think we must discard the psychosomatic explanation because the same triangle appeared last night on the stomach of my son. It is exactly like mine and located in just the same place. It doesn’t seem to be painful, for the child pays no attention to it. It’s important to point out that similar objects to the one described by “Dr. X” were seen in Spain on the same day and on the previous evening, and then again on December 7 in Morocco and on December 9. Photographs of the strange triangular marks experienced by Dr. X and his son. After previously witnessing a UFO landing in a field and abducting cows for genetic material, a self-proclaimed UFO expert returned to Dawlish Warren for further investigations. 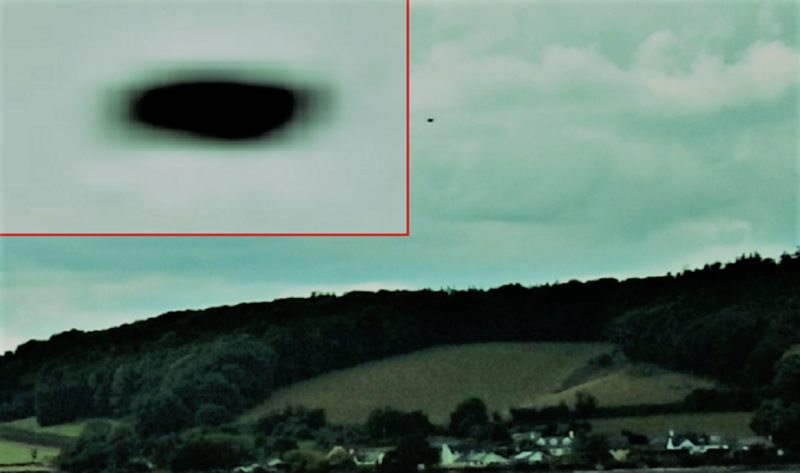 John Mooner claimed to have seen a UFO landing in a field in Dawlish on November 25, 2016. He came back to the area on January 4, 2017, and to his surprise, he saw the same thing flying across the sky. The second sighting came just days after he noticed the first UFO of 2017 flying over Newton Abbot on Monday. Mr. Mooner of Newton Abbot, who claimed to be a chief photographer for World UFO Photos, said he made a return visit to Dawlish Warren to conduct more investigations into his UFO sighting involving a landing in a farmer’s field. He was standing in the same position as the last time he experienced his UFO sighting to observe the area. He said that it was cold that time, but it was not enough to discourage him from his UFO watch. He said he stood in the area looking in the field for hours when a similar or perhaps the same UFO flew across the sky that made him dumbfounded. He started taking photos as the unidentified flying object flew over the field and off into the distance. Because of the tremendous speed of the UFO, he did not manage to take a zoom into it. He just managed to take four photographs that show the movement of the UFO as it passed over the field. When he got home, he enlarged the pictures to see the object closer. He said the UFO had no wings and looked oval. He was certain; the strange aerial thing was not a commercial aircraft. He feels that the second UFO he spotted was the same transit van sized UFO he observed landing in the field last time. The photographs were snapped on January 4, 2017, at 3:27 pm at Dawlish Warren. KENS NOTE: John Mooner is the Chief Investigator for World UFO Photos.org. John has been working for me for many years now and he has some of the most incredible UFO/Alien craft photos in the world. His hot spot is Newton Abbot Devon England. The observation took place on May 24, 1971, from a dentists’ surgery on the first floor of a building on the Calle Pedro Molina, right in the very centre of the city of Mendoza, with a wide open pace towards the south, extending as far as the promenades of the civilian quarter. We observed, in the direction of the Military Circle, far off and high in the sky, an unidentified object (stated Señor Julio Suárez Marzal)… I remained alone in the dentist’s surgery, while Dr. Walter Griehl ran to get some binoculars, returning just as the object was disappearing. During his absence from the room, in just a few seconds of time, a whole series of events had occurred: I had seen the object come closer and perform the most curious movements.The object is moving silently, floating and drifting along very slowly from east to west, at an altitude of some 1,000 metres and somewhat over 1 kilometre towards the S. E. from me (rough guesses). The colour is a pearly-grey, faintly bluish, dull. Its brightness make it stand out sharply against the deep blue of the sky. At once it starts to descend with a rocking movement, and I perceive that it is slowly revolving, at least so I judge from a small bright circular mark which stands out on its surface. The object rapidly descends toward where I am, and approaches eye-level, with the astonishing speed which characterizes the close-up as shown by the camera, as it registers a dizzying succession of gradations of approach. Now the object pours forth a dense cloud, like steam in turbulence, which surrounds it and grows . As it draws nearer it grows larger. It worries me that I can’t see it clearly (the witness is here referring not to the UFO itself but to the bright point on its surface, a will be perceived by what follows). However. I imagine it must be some kind of view-finder adapted to a tubular axis. The UFO darts sideways at such speed that it suddenly vanishes; then surprises me by reappearing much lower down, where it immediately stop, rocking to and fro slightly. When it first arrived it was incandescent, of a dark orange colour, and without the cloud around it. Now it is a clearer pearly grey. It is very near me, at about 70 metres, and at 16º , to the S.E. While remaining stationary it now seems to glide along horizontally, moving away and then imperceptibly approaching again, like a photographic close-up. At this point in its approach I see only those parts of it that interest me and I pay no heed to the total appearance, which moreover seems cut off visually. For about four seconds it is completely stationary in the air, silent, vibrating very slightly. This is the actual flying saucer itself, a solid object, a sort of metal. l have a magnificent view of it, with absolute clarity, bathed in the sunlight. I suddenly feel myself very much alone, I experience an indescribable loneliness at the weird realization of the presence of this strange reality. After a quick glance to take it all in. my eye is caught by one detail: the bright point mentioned previously is now close, in three-quarter profile, like an external telescopic eye; it is a short cylinder, bell-shaped, the colour of old bronze, with shining frontal areas. Attached to the upper part, on the projecting, clearer portion of the cylinder, is a tubular central fin (we could call it a handle) of the same greyish colour as the whole surface of the craft. I examine the structure of this viewer in every minute detail, and while I am studying its strange upper part the saucer gives a slight shudder and climbs away obliquely, travelling off rapidly towards the N.E., leaving me as it does so with a general view of the said upper part of the viewer; it seemed to have several other details on it, and I could make out a reddish contour on the back portion. To my surprise, having lost sight of the saucer for some four seconds, it reappears, and even closer, and now in complete and total view, making great strange rocking movements. The thing I had taken to be a sort of “eye”, a viewer, assumes the position of a focussing lens (or, as we would say, a “sight”) and follows any given point by mean of marked corrections, upwards, downwards, right, left, centre, with the speed and the touch of someone who wants to take precise and rapid aim because of the movements of the whole body of the flying craft, including too a pronounced to-and-fro rocking motion through about 35º . The viewer is pointing towards the parabolic shortwave antennae of the Central Post Office. The sunlight shows up the viewer more clearly, and I can now actually feel the presence of someone who, with precision and intelligence, is directing the viewer’s movements from inside the craft. (This scene lasted ten seconds in the opinion of the witness, who is accustomed to film-making.) 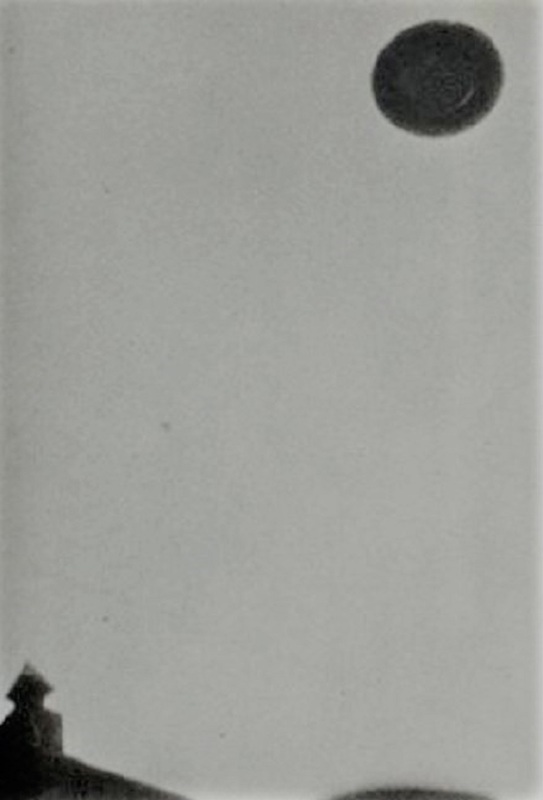 The two appearances of the stationary saucer could have been filmed perfectly, or recorded on colour stills, for the saucer was magnificently revealed by the sunlight, thus permitting the sharpest, clearest vision. The remaining views of the saucer were extremely rapid, dancing, so that the eyewitness could not hold it well in focus. When I first observe the saucer, it shoots away from the foreground like a bullet vanishes in the sky, then reappears instantly afterwards at a height of some 1,500 metres and at approximately 29º, towards the S.W. It slowly floats, as at the outset, from east to west. It changes shape, as when a conjurer does his tricks: at one moment it is elongated, then it is a globe. then it looks like a little hat, then it is oval, as it drifts along with a rocking motion. Suddenly, as though taking its bearings, it quivers two or three times in rapid succession, then does a right-angled change of direction and moves off fast towards the south leaving an ever-darkening veil of vapour (which assumes a pale old rose shade) that hampers vision, till finally it i lost to sight. It is very hard to say what size it was, seeing that it represents the unknown. Perhaps 6 metre in diameter and 2 metres high at its centre, as arrived at by a few calculations and sketches. I was out walking our large super high energy dog who is a Chesapeake Bay Retriever around 6:30 pm and a few minutes into our walk she just suddenly sat down and would not move. This is completely unlike her, and it was then that I realized she was looking up into the sky at something and as soon as I looked up, I was suddenly mesmerized by this glowing, stationary orb like object that she was looking at as well. I have never seen anything like it. I have worked in aviation and with many airlines, and I know this object was not like anything that I have ever seen or experienced in my career or life up until tonight . I know this was a UFO. I can’t explain it but judging by the physical and emotionally overwhelming reaction that I felt during the sighting, I just “knew”. After several minutes, my dog nudged me to go back inside, but I just couldn’t. I remembered that I had my phone in my pocket so I took some videos and pictures, and as soon as I began recording, I suddenly saw two other lights in the sky, both of which I believed may have been commercial airliners, in addition to the initial object. However, the original orb I saw, continued to hover in the same position, while the other two were following what looked like normal flight paths. Then suddenly one of the commercial planes, made a strange maneuver that seemed very abrupt and maybe intentional, due to how awkward the angle was that the aircraft turned toward the object in question and seemed to have intentionally crossed into the area where the orb was that I had seen initially. It was at that moment that the orb started to slowly move “backwards” as if it were a car that was in reverse, and disappeared into the clouds. At 10:30 am on Saturday, May 3, Carlos Antonio de los Santos Montiel a young 23 years old pilot was flying his 58′ Piper PA-24 Comanche marked as XB-XAU from the city of Zihuatanejo. That morning was cloudy with considerable smog, mist and very poor visibility. Carlos took off, nevertheless, at 10:30, without having his breakfast. He climbed his little plane to 13,500 feet but conditions were still bad so he climbed to 14,500 where he found a clear blue sky and continued on his return trip to Mexico City. At about 12:30 pm, After establishing a set course, he wanted to visually find the Lagoon of Tequesquitengo, when he couldn’t find it, he re-checked his instruments and continued flying. Shortly he became aware of something on his right and looked in that direction and was shocked to see an object with the appearance of two plates joined together at the rim with a dome which had what seemed to be some sort of windshield. It was positioned 20 centimetres above the surface of the wing and about 1 1/2 meters from the Piper’s cabin. Four or five seconds later, he observed a second flying object settling itself about nine inches over the left wing. At that moment, he began to feel extremely nervous and stuttered a bit while talking to himself trying to calm down; he couldn’t believe what he was seeing. Suddenly, he discovered a third object moving rapidly almost impossible to see, losing altitude and placing itself in front of the plane’s cockpit. For a moment, he thought that it was going to crash into him, but it plunged to the underside of his Piper at a 45 degree angle and hitting the lower part of his craft as he felt a loud bang coming from the bottom of the airplane. Carlos then noted that his airspeed had decreased from 140 nautical miles per hour to 120. He tried to bank to the left, in an attempt to “bump” the object away from his plane but the controls were frozen and would not move. He then tried to let down the landing gear, hoping to get rid of the object under him, but with no results. The plane kept its original course, but it was gaining altitude, and Carlos feared that if it went any higher he would die because his cabin was not pressurized. Scared even more, which caused him to cry and he was badly shaking. He communicated with the Air Traffic Control Center and told them what was happening. Mexico Center did not answer him and the silence increased his fear. He thought that perhaps they didn’t believe him and most likely they didn’t even want to answer him. Since he was certain that the third object was attached under the plane’s fuselage, he decided to lower the landing gear in the hopes of detaching the object from the plane if possible or to find out if the landing gear was damaged. In effect, the landing gear did not come down, there were no light indications on the dashboard and the emergency lever did not work either, which meant that the object prevented the landing gear from lowering. He tried communicating again with Mexico Center and he informed them that unknown forces were controlling his aircraft and had lost control over it. Again, no response was received. He thought that perhaps his radio did not work or those objects were preventing it from working. After some time Mexico Center responded:”Take note extra alfa union, give me your position and your situation. We are contacting competent authorities and…” (Carlos interrupted again) Carlos: “The aircraft is out of control”. Mexico Center called also for any aircraft that was flying in the vicinities of Carlos’ position. They received a response form another small plane tagged as XC-SAG[Extra Coca-Sierra Alfa Golfo] at that time belonging to the Agriculture and Livestock Department. This air craft was flown by a pilot with the nickname of “El Charro”. He was asked if he had visual contact with Carlos’ plane in order to confirm and validate Carlos’ story. After a long silence “El Charro” confirmed that indeed there were three objects attached to Extra Alfa Union[XAU], then Mexico Center ask if he can aid Carlos’ airplane. Shortly after that and after Carlos’ airplane being escorted for 18 minutes for this unknown craft, while arriving at the Ajusco mountain range and nearly flying over the town of Tlalpan, These objects suddenly left Carlos heading towards the location of the Popocatépetl volcano at a speed greater than 900 km/hour. Carlos did not see them again and regained control of his aircraft, but he was still very frightened. 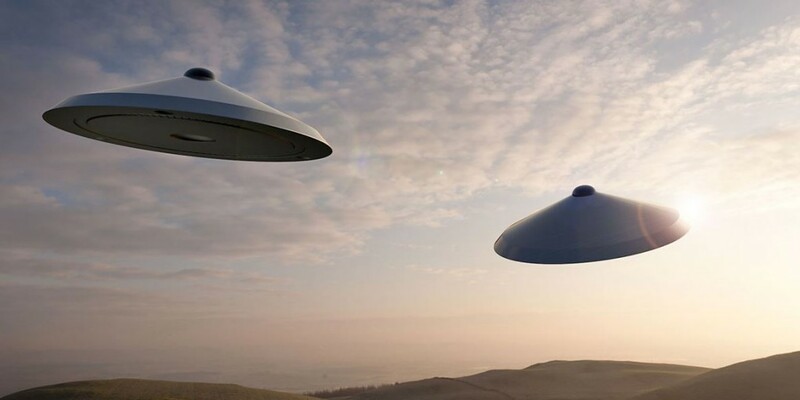 As the objects departed, two radars at Benito Juarez International Airport captured the three departing UFOs around his craft making 270-degree turns in a very tight radius of action of just 3-4 miles. After gaining control of his Piper, Carlos made the operators know that his landing gear remained retracted, due to the impact with the third object. At this point, Mexico City International Airport closed its runways to traffic and prepared for the expected emergency landing. He was forced to circle over the airport 11 times. He then opened a tool box he kept inside an used a large screwdriver as a makeshift lever to force the gear down. He finally after 40 minutes successfully landed the plane in a grass filed between two landing strip. He immediately was taken inside the airport clinic for a checkup and was given some sedatives to calm his nerves. After long tests and deliberation the physician confirmed his good health and gave him permission to continue flying. No ilegal substance was found on Carlos body that indicated an altered perception or hallucination of the events. Carlos de los Santos, like his brother and two cousins, was a student of astronomy at the National Autonomous University of Mexico. With this background, one could hardly confuse a balloon or the planet Venus with anything else. He described the objects as follows: “They were oval disc-shaped with a dome, about three to four meters in length without antennas, had a dull grey fuselage like the colour of a rat’s fur and a sort of windshield that seems polarized because he was unable to see inside the craft. The outer shell was all without rivets and completely smooth, the material were not as reflective as a regular polished metal considering that there was a strong illumination coming from the sun at the time”. Several UFO investigators from Mexico and the U.S., who had the task of investigating Carlos de los Santos’ incident, have concluded that he was “a perfectly normal young man who was obviously frightened by something extraordinary that had arisen in flight.” NOTE: The above image is CGI. On November 9, 1979, approximately between 10:00 a.m. and 10:30 a.m. Taylor, who was at the time working for the Livingston Development Corporation, parked his pickup truck at the side of a road with the intention of examining the progress of some saplings in the forest. Being unable to access the forest by truck, Taylor and his dog made their way into the forest on foot along one of the forest paths that lead up the side of Dechmont Law. Upon entering a clearing approximately 500 metres away from his truck, Taylor saw what he described as a large domed object totally motionless and silent hovering above the forest floor. He estimated the object to be about 20 feet in diameter. It had a ring or flange of some sort around it, which caused it to appear like a brim on a hat. Protruding from the outside of the UFO were stems pointing up, and topped with propellers. The object seemed to be constructed from a dark grey metallic material which appeared transparent in places. Taylor later described the surface of the object having rough texture similar to that of sandpaper and suggested that by having transparent areas on its surface, the object was attempting to camouflage itself with its surroundings. Taylor began to approach the object and upon doing so two smaller spheres three feet in diameter, which looked to be made from the same material, appeared to drop from underneath the craft and began to roll towards him. Taylor described the smaller spheres as having appendages, making them similar to sea mines in appearance. As the small objects moved towards him, Taylor described them as making a “plopping” noise as the appendages made contact with the ground. The small spheres maneuvered around Taylor and by using their appendages, attached themselves to each side of his trousers, just underneath the pockets. Taylor said at this point, he heard a hissing noise coming from the small objects and he began to choke due to a strong acrid smell which he believes was being secreted by them. He described this smell as “burning automobile brake linings” which caused him to cough. By now, Taylor was aware he was being dragged by the smaller spheres along the ground towards the larger object. He eventually fell forwards onto his face and lost consciousness. Taylor later regained consciousness and upon doing so discovered the object had disappeared. Taylor then discovered he had trouble attempting to speak and could not get to his feet. He then crawled 100 metres along the ground and managed to stagger the rest of the distance back to where he had parked his truck. On reaching the truck he attempted to call for help on the truck’s two way radio, but struggled due to his loss of voice. Taylor then attempted to get back home in the truck, but accidentally ditched it in soft earth while trying to drive in his condition. Due to his vehicle being stuck, Taylor walked the rest of the way back home. He arrived around 11:45 AM. When his wife saw him, she was shocked. He had mud all over him, and his pants were torn. He began to tell her of his ordeal with the UFO. His wife urged him to call the police, but Taylor felt that they would only laugh at him. Instead, he called his job supervisor, Malcom Drummond. Drummond called a doctor, and he drove directly to Taylor’s house. He was so eager to hear Taylor’s story that he questioned him while he was in the tub. Drummond and Taylor both felt that there should be physical proof of the incident in the forest. Since the doctor was coming to check out Taylor, Drummond headed to the scene via Taylor’s instructions, but he could not find the right location. While awaiting Drummond’s arrival, Taylor complained of a headache and kept saying that he had been “gassed”. Drummond and Taylor both attended the scene of the incident a short while later the same day and discovered strange indentations in the forest floor which Taylor stated had not been there earlier that morning. One set were described as looking like rungs in ladder, the other indentations which numbered forty in total were suspected to be the tracks left by the smaller objects. No scorch marks were seen on the forest floor. Staff of the Livingston Development Corporation later took photographs of the scene. On the research regarding this incident we noticed that the craft/object witnessed by Taylor is being depicted spheroid in most of the available illustrations over the internet. We based our renderings on the drawing made by Taylor’s son-in-law shortly after the incident took place aided with the verbal description of Robert Taylor. Also, it is important to know that we did not find in the official reports made by Taylor indicating that the craft was completely a sphere. In a recently produced documentary by the National Geographic Channel where this case was featured, new information has been revealed. In 2012, 30 years after the incident, David Hammond, Bob Taylor’s son-in-law and author of the famous UFO sketch that was used to described what Taylor saw that morning stated that he believe that the sketch he created may have mislead people whether the UFO had legs. Taylor described the object hovering over the forest floor but Hammond suggested that the UFO should have been resting on legs based on the “tread tracks” found on the ground by investigators. Based on these findings, we decided to depict the craft in our renders without the “legs” . Still, the fact remains that those rectangular tracks on the ground seemed to be made by the object. There is no evidence to this day stating that these tracks were made from a man made machine. There were no matching equipment tracks on the region when police made their investigation. Neither found evidence that a machine was entering and/or leaving the area due to the lack of tracks on the surrounding area. NOTE: The above image is CGI. On September 5th of 1981 around 10:00pm of the Saturday night, in Corona, Queens. 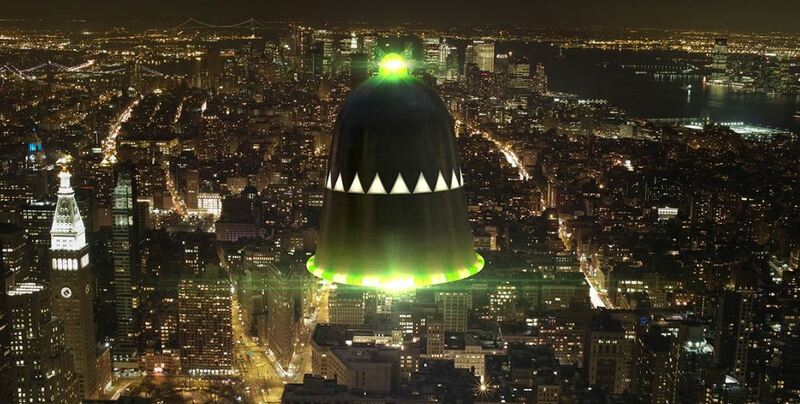 At least ten people said they saw a bell-shaped UFO with flashing multi-coloured lights making a beeping noise while hovering through the New York skies. The object hovered over a tenement block, a triangular-shaped ray of green light shot out from the bottom of the object and shone on the face of a teen-aged girl observing the object from the window of her friend’s house. She cried to her companion that she felt she was being “taken” by the UFO before she was pulled away from the window. The UFO was observed near 104th St. and 44th Avenue in Corona, Queens. It was described as bell-shaped with a flashing green light on top and swirling coloured green and yellow lights around the bottom edge. Centred in the bottom part of the “bell” was a green triangular light surrounded by white circling lights. It was also said to have triangular windows lit with white light around the upper part of the bell and was making a beeping noise. Witnesses described it as flying about 40-50 stories above their tenement homes. The mysterious craft moved slowly towards the end of the block of 108th Street, then it came back and hovered over a three-story tenement building located at 10447 44th Ave. witnesses said. As the UFO moved over towards 108th St., witnesses heard a airplane engine noise approaching. This airplane had two strong beaming searchlights, when the jet’ lights where beamed at the UFO, at that moment the object shot out of sight. Witnesses said they knew the jet was not a commercial airliner coming into nearby LaGuardia airport because the normal airport flight pattern was in a different direction. The noise of the jet was also said to be unusually loud, indicating it was flying lower than commercial jets. Three members of the Colon family and their cousin Lewis Alya and Diana Martinez, who was hit with the green ray. and Diana’s grandfather waited until Sunday morning to tell their story of the UFO to Jayne Turconi, who delivers the “News World” and “Noticias Del Mundo” in the area. They did not call the police for fear of being considered “crazy.” Throughout their story, they emphasized how terrified they were during the encounter. Diana Martinez. 14. was at the home of Oneda Colon, 13, when she saw the object out the second-floor window. As she was looking with her head out the window, a green ray shot out from the triangular light at the centre of the object and shone on her face. She then cried to Oneda. “Smack me. smack me! It’s taking me!” Oneda hit her face and pulled her away from the light. Diana said, “For two minutes I looked away. Everything went blank for me.” Oneda’s mother. Carmen Colon. 31, saw the UFO also. She said “The girls were screaming. So I ran to see what was happening and I saw it.” Diana said. “The UFO was about ten stories high above the ground when the green light hit my face.” She said it appeared to be as wide as 2 1/2 city streets side by side(approx. 110 feet). Jimmy Colon, 13, Oneda’s brother, said he saw the object when he was standing on the corner of 104th St. and 45th Ave. “It was about 5O stories high I above the ground, making a circular pattern around our area. The UFO rotated in circles. It had green light that beeped on and off.” The noise he described as “whoo-whoo.” sounding as the light flashed and stopping when it dimmed. “It went around three times and then I came home and it disappeared. Before it disappeared it was still rotating but in the same spot and then after it had advanced a little bit. it slanted upward so fast I couldn’t see it. and it disappeared.” said Jimmy. He also said when the object stopped, it hovered over a power line. Jenny Colon. 13. said she saw it after Diana and Oneda. She said the UFO took up an arc of the sky about three feet wide. “I saw a three-foot object with different colour lights swirling around the bottom with a green light lining on and off. It seemed to circle the area around our block. It went pretty last.” She said it lasted about 15 minutes. The Colons’ cousin Lewis Alya also said he saw the object. Other witnesses said they saw some coloured lights and heard the jet coming and saw the search lights from the jet. Aerial Phenomena Research Organization (APRO) said that UFOs with similar characteristics, notably the triangular structures, were sighted in upstate New York in recent months. Lebelson said APRO would probably investigate the sighting, perhaps using a dermatologist to see if the reported beam of light left traces of radiation on Diana’s skin. NOTE: The above image is CGI. According to the witness’ testimony filed with MUFON on December 19, 2016, he was standing outside his home in Orlando, Florida, at about 5:24 p.m. on December 18, 2016, when he looked up and saw a large and mysterious glowing craft flying northward from the south. The UFO, according to the witness, was flying below the normal altitude of commercial airliners. “Had a feeling to look up as if I had to, and then I saw the glowing craft fly from south direction to north,” the witness told MUFON, according to Open Minds-TV. 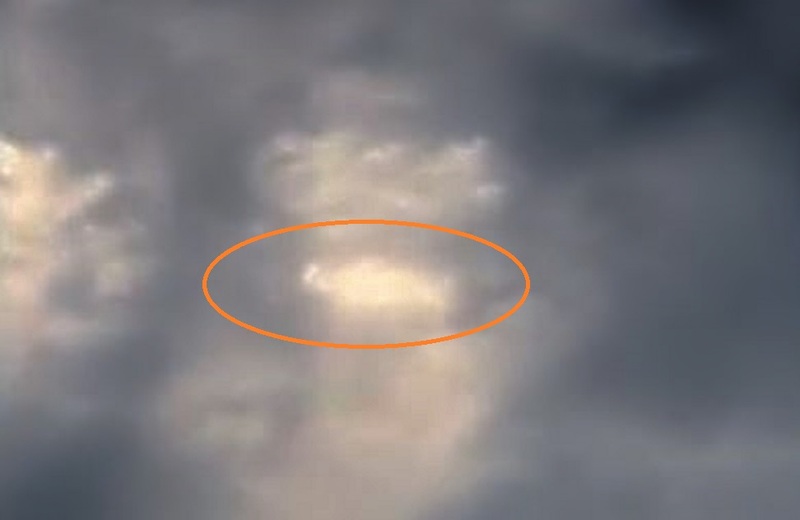 “It was flying high, but well below the commercial airplanes flight altitude that were in traffic during the afternoon.” The witness took out his cell phone and began filming the mysterious glowing object in the sky. He was unable to estimate the size of the UFO craft but he guessed that it was flying at an altitude of about 1,500 feet. He watched through his cell phone camera as it flew higher in the sky and eventually entered into a small cloud. The helicopter pilot waited several seconds for the UFO to emerge from the cloud but it did not. 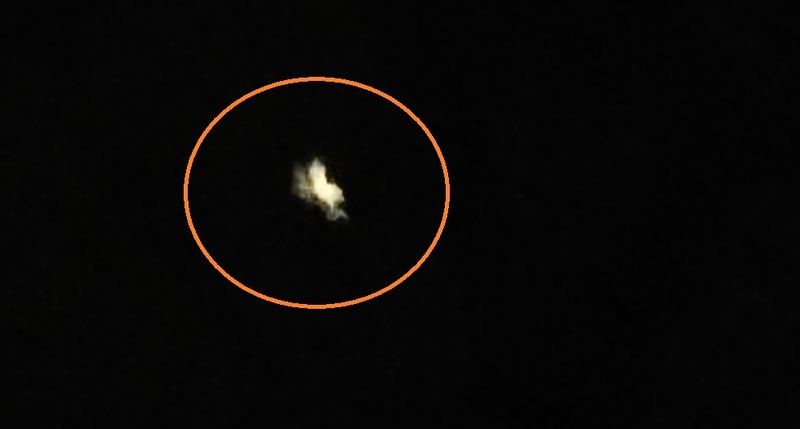 “I filmed it and I saw it go inside a very small cloud,” the witness said. “It should have flown out of it in a second, but it didn’t.” Amazed, the witness stopped filming and watched expectantly. After a few minutes, the mysterious UFO emerged from the small cloud. It changed direction, ascended even higher and eventually disappeared. The helicopter pilot insisted that the object was unlike any man-made flying craft he had seen. “I’m a certificate helicopter pilot and I know that this was not a plane, helicopter, rocket, meteor, birds, balloons, blimp, etcetera,” the witness said, according to Open Minds TV.